The historic Harbour Board Building (often referred to as the 'White Building') on the corner of Flemming Street and Strand Street was built in 1904 and used for 70 years for harbor administration by the South African Railways and Harbours. Most people pass it while on the Settlers Freeway and only get to see it's top, but the exterior of the building has massive and impressive stonework. The inside is even more spectacular with richly ornamented woodwork and stained glass windows. The building is generally regarded as one of the best examples of Art Nouveau architecture in South Africa and was restored in 1998. The Old Cash Store on Sardinia Bay Road has been a popular spot over the years but since October last year something has changed. Well, for a start the name did. It's now called The New Cash Store. But a name change did just fall from the sky. It came with new owners Doug and Clair who have blown new life into an old favorite. Steak and burger night, pasta night, seafood night, pizza night, live music, an organic market once a month and so much more. Tuesday night is rib night and the other day I decided to pop by and see what the fuss is all about. What an awesome spot! 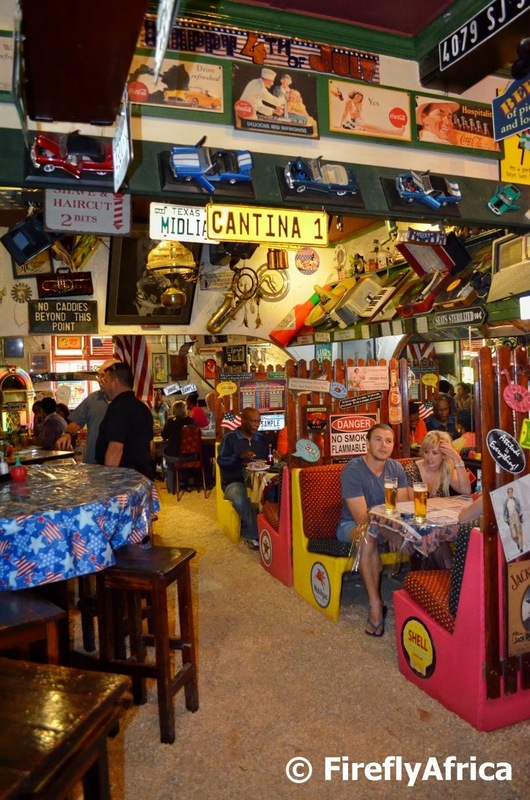 Covered deck, inside dining area, relaxed atmosphere, friendly people and excellent food. 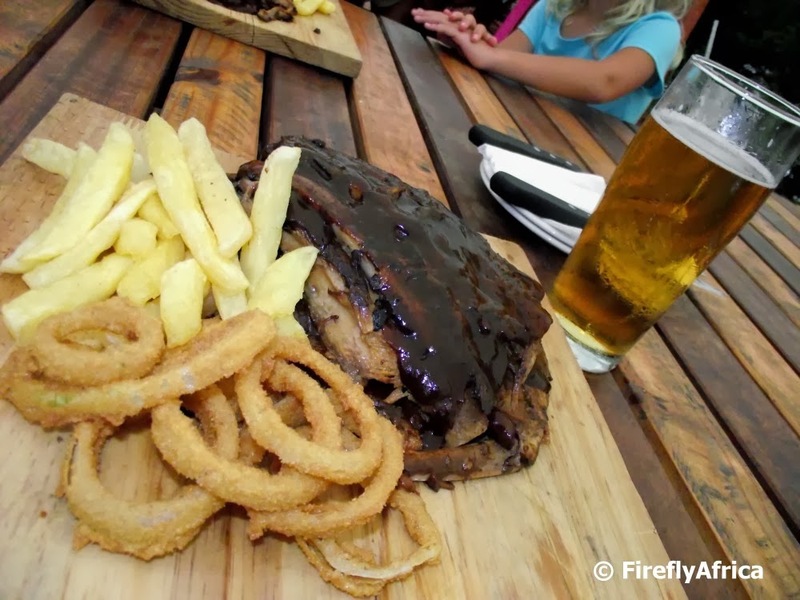 Here's my ribs, chips and onion rings, washed down with the Frontier craft beer, brewed by Doug and his team. I'm really looking forward to my next visit. Approaching Port Elizabeth from the west you have to drive over the Van Stadens River Bridge about 40 kilometres outside of town. Looking down into the gorge you can just imagine what an effort it must have been getting through that back in the earlier days. 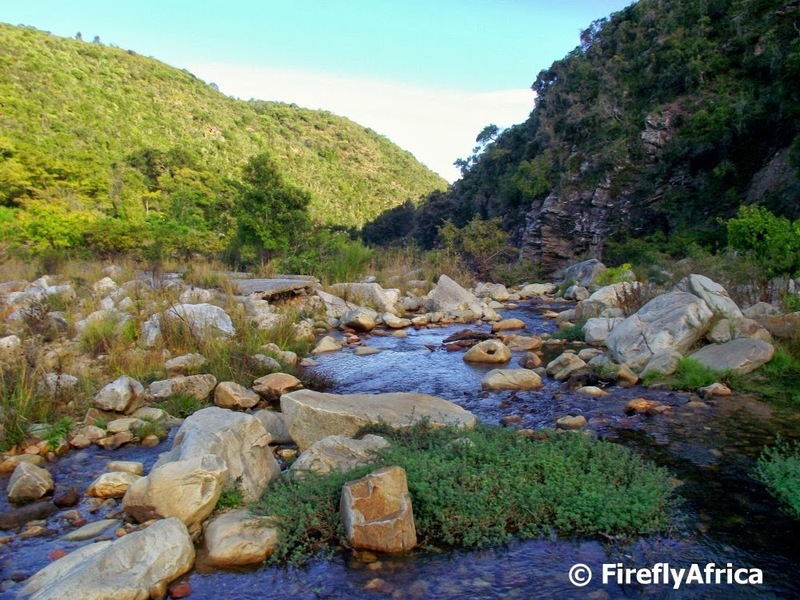 The river was named after one of the area's pioneer farmers - Marthinus van Staden, who was the first person to plot a basic route through the gorge in the 1850's. 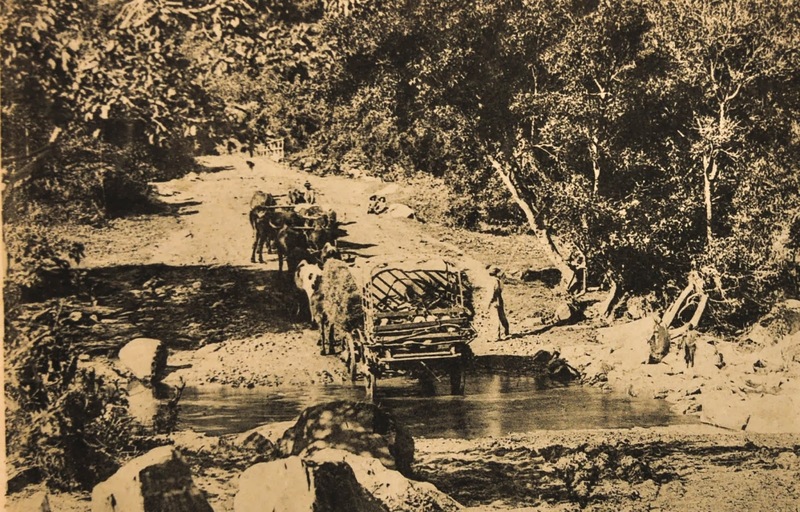 In 1867 Thomas Bain rebuild the pass so that ox wagon traffic could safely travel through. Over the next hundred years the pass saw regular improvements and widening and it was finally tarred between 1950 and 1953. In 1971 the N2 bridge over the gorge,the 1st of 5 large concrete bridges along the N2, was opened. The bridge is an arch bridge design with a height of 140 meters and a span of 198.1 meters. Micro breweries are becoming the in thing lately with a lot of the younger beer drinkers preferring to drink the locally brewed beers at these establishments. 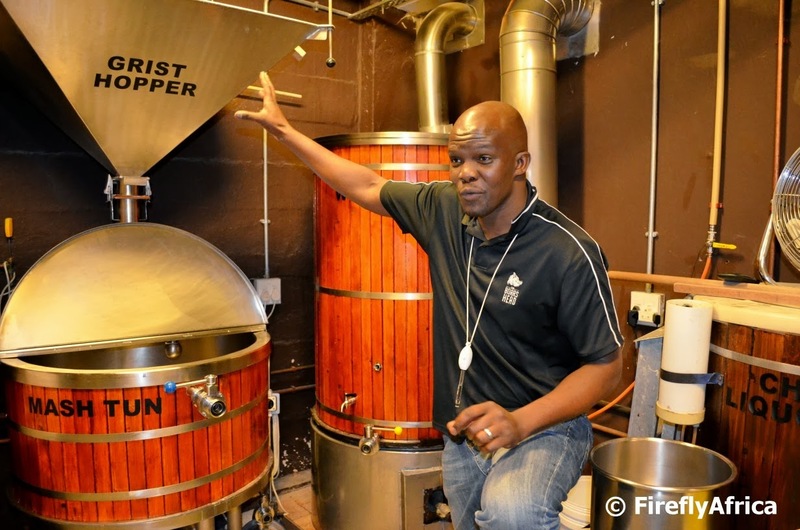 The Bridge Street Brewery brews their four in-house produced beers on site at the restaurant in the lower Baakens Valley and patrons and visitors can go on a short brewery tour of the facilities. On the night I took the picture one of the assistant brewers took us around. You could see his learning from the best, Lex Mitchell himself. 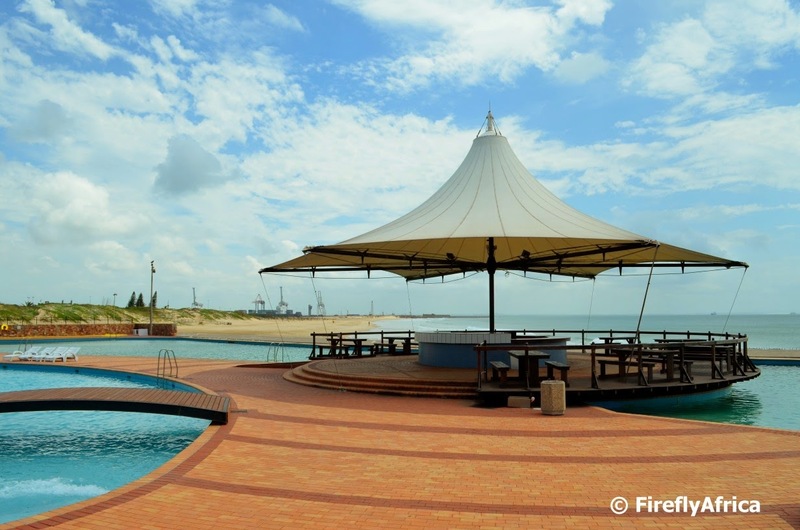 The view of the Port Elizabeth beachfront from the top floor of the Radisson Blu Hotel is breathtaking. Don't think I need to say anymore. On New Years Day we went looking for a quite beach to relax on, cool off and catch some sun. We discovered the ideal spot in Kini Bay. A gully right in front of Sea Otters Lodge. 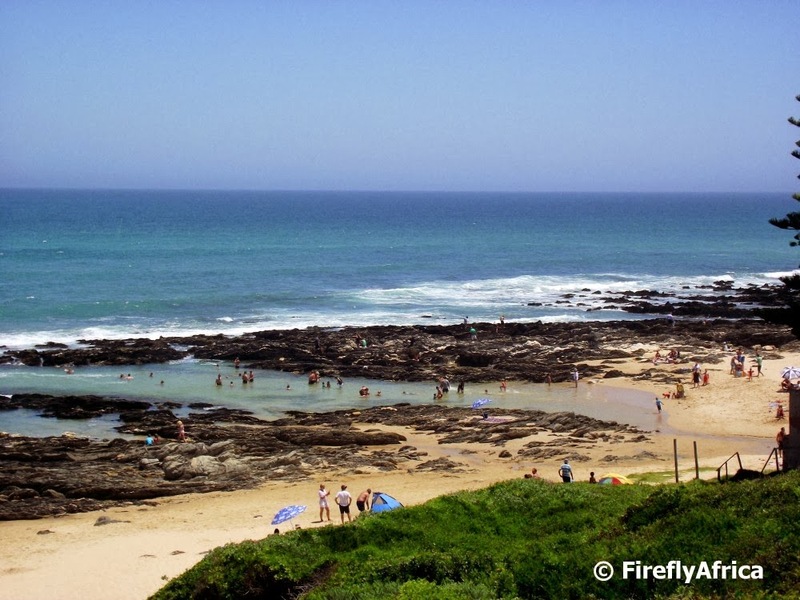 While Port Elizabeth's main beaches were packed to the brim, the Kini Bay beach was nice and quiet and the gully was a safe spot for the KidZ to swim and snorkel at their heart's delight. We will definitively come back to this spot in future. life and harmony without end. A little while ago I stumbled, once again while out Geocaching, on the MOTH Shellhole on the Kragga Kamma Road. A quick bit of research shows that there seem to be two MOTH Shellholes in Port Elizabeth. This one is called the Outspan Shellhole with the second one being the Aloe / White Ensign Shellhole in Walmer. There may be more but these are the two that came up in my search. By the way, the cache at the Shellhole is a toughie but I can say I've ticked it off my list. 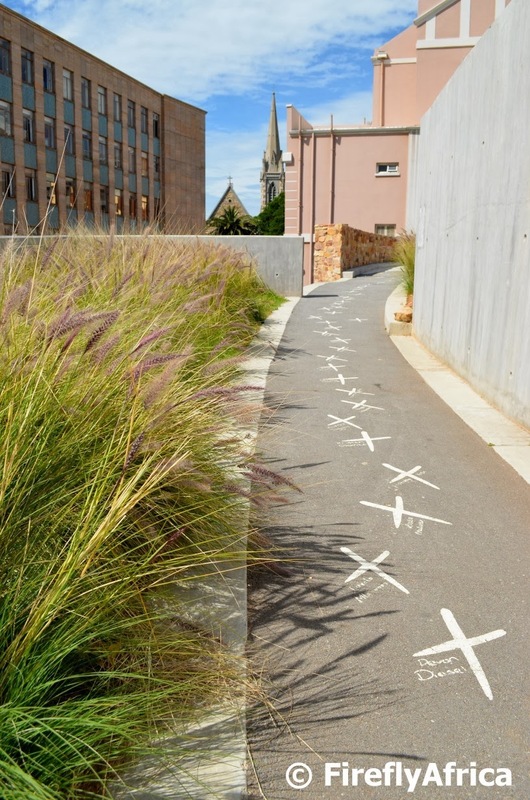 There are two ways to walk up the Donkin Reserve from Chapel Street. The first is up the Mosaic Stairs and the second along a winding path that snakes it's way up to the lighthouse and pyramid. The path is called the Election Queue as it represents the winding queues on election day during the first democratic elections in 1994. It's the same walkway that skateboarders have discovered to be the ideal downhill run making it very much a multi purpose walkway. On the walkway are painted crosses with names next to them. During the official opening of Route 67, 3000 school kids stood in a symbolic voting line along the path. It is their names next to the crosses and each cross represents a future vote. The iconic South African playwright, Athol Fugard, famous for plays like Master Harold and the Boys, Sizwe Bansi is dead and The island, has very close links to Port Elizabeth. Fugard's mother ran the St Georges Park Tea Room which sadly stands empty today. It was here in 1950 that a teenage Fugard insulted his friend and father figure, Sam Semela, a waiter at the tearoom. Thirty years later still shamed my the incident he wrote the play Master Harold and the Boys based around that day and his relationship with Sam. In the play Sam makes Hally (Fugard) a kite from junk and teaches him to fly it as well. Sam also teaches Hally that flying a kite means holding the head high and it was very special advice for Hally who was having a bad day. From that day a special bond was created between Sam and Hally. Later on the in the play Hally, in a moment of anger, mistreats Sam and Willie - another worker at the tea room. But I'm not going to explain the whole play here. All this does work up to the next point I want to make. Outside the old tearoom artist Mark Wilby has created a memorial to Fugard referring to the play. 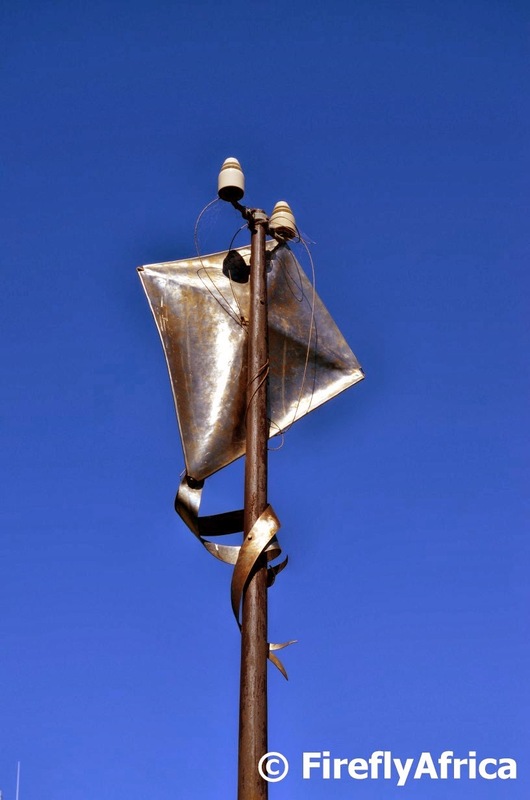 Inspired by the kite Sam crafted for Hally, the memorial is a simple stainless steel kite on top of a lamp pole. I bet not a lot of Port Elizabeth folk knows about the kite. I took this panorama of Hobie Beach with the Boardwalk Hotel and Conference Centre in the background from the Jester the other day. Cruising on the Jester does give one a whole new angle to look at the Port Elizabeth beachfront from and you just realise again how beautiful our beachfront is. The Donkin Reserve is truly one of Port Elizabeth's iconic attractions. The pyramid (Donkin Memorial) was commissioned by Sir Rufane Donkin in August 1820 as a monument to his wife Lady Elizabeth after whom he named the town. 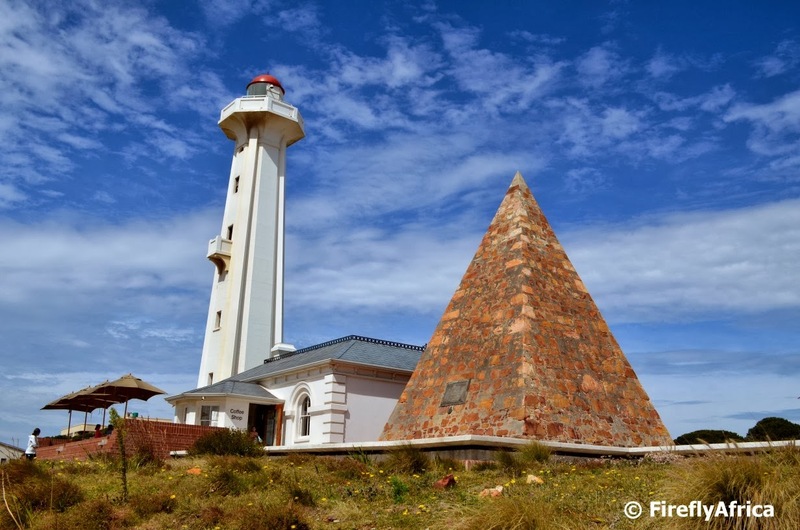 Sit Rufane was the Acting Governor of the Cape Colony and came to Algoa Bay to oversee the landing of the British Settlers The Hill Lighthouse was brought into use on 1 June 1861 with Charles Hammond as the first lighthouse keeper. The cottage adjoining to the lighthouse was built in 1865 for Hammond's family. In 1929 the height of the lighthouse was increased because the town's lights behind it started to interfere with its visibility from the bay and in 1973 it was decommissioned and replaced by the Deal light. 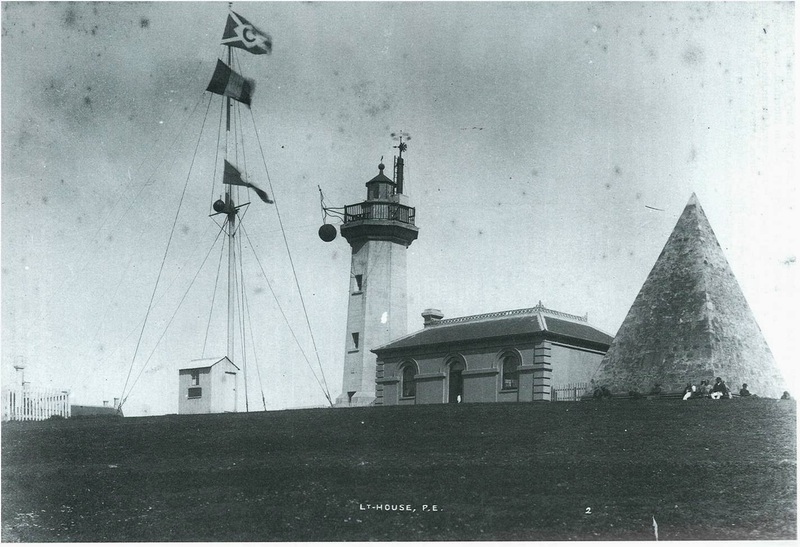 In the now picture the difference in height of the lighthouse is clearly visible. 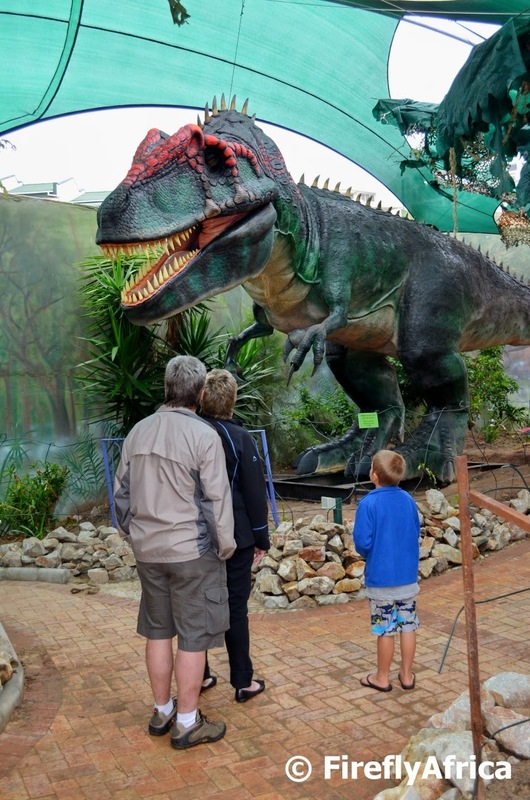 The lighthouse keeper's cottage is now occupied by a Nelson Mandela Bay Tourism﻿ Visitor Information Centre and the Green Leave Cafe coffee shop. The Donkin Reserve is quite a popular tourism attraction with visitors coming to see both the history as well as the art pieces forming part of Route 67. The historic picture is from Margaret Harradine's excellent book Port Elizabeth - A social chronicle to the end of 1945, a book well worth getting if you are interested in Port Elizabeth's history. A black ball is dropped at 1 o'clock, Cape mean time corresponding to 1h. 28. 34.6 sec mean time at this place from the lighthouse on the hill every day, Sundays and Public Holidays excepted. Latitude of Lighthouse 33º 57m. 45s. S.
Longutude of " 25º 37m. 16s. E.
If anything occurs to prevent the drop of the ball at the proper instant, a red and blue chequered flag will be shown from the upper window of the Lighthouse, and the ball dropped by chronometer at 1h. 05m. 00sec. Cape mean time, or 1h 33m. 34.6sec., Port Elizabeth mean time. 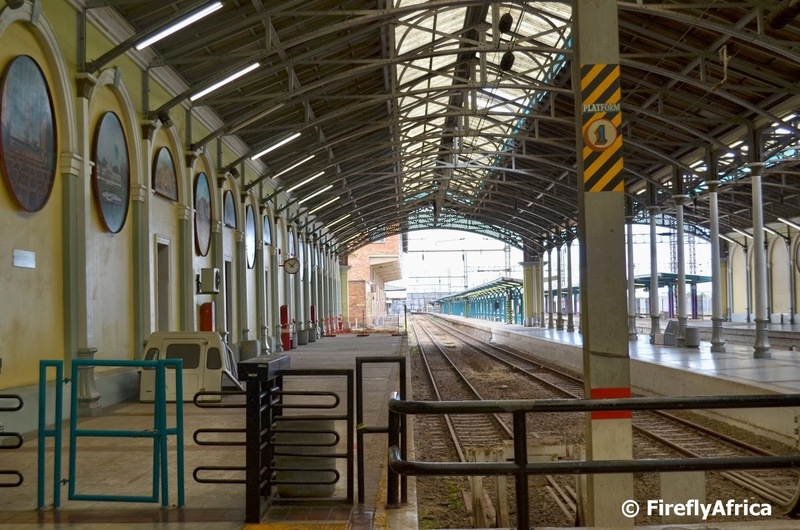 The Port Elizabeth Railway Station has been around for a while, existing on it's present location since 1875 when the first line was constructed to Uitenhage about 40 kilometres away. The original building was designed by the town's Resident Engineer for Harbour and Public Works, James Bisset. In 1893 extensive additions were completed, including the cast-iron supported roof of the main concourse, designed by E.J. Sherwood. It's a pity that rail travel has declined so much over the last few year which also means less people get to see the station. I wonder how many people driving the Swartkops road on a regular basis don't even notice the flamingos anymore. 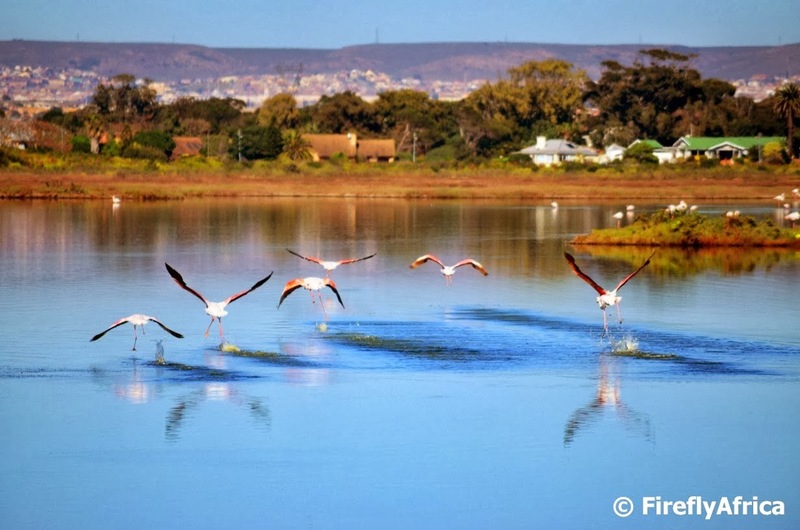 I think its awesome to have so many flamingos on the Swartkoms estuary right here close to the city. I walked the Flamingo Trail recently and snapped this pic of the flamingos taking off as we started to get too close. On a recent guided walk around St Georges Park, our guide told us a very interesting fact about Doncaster Road. 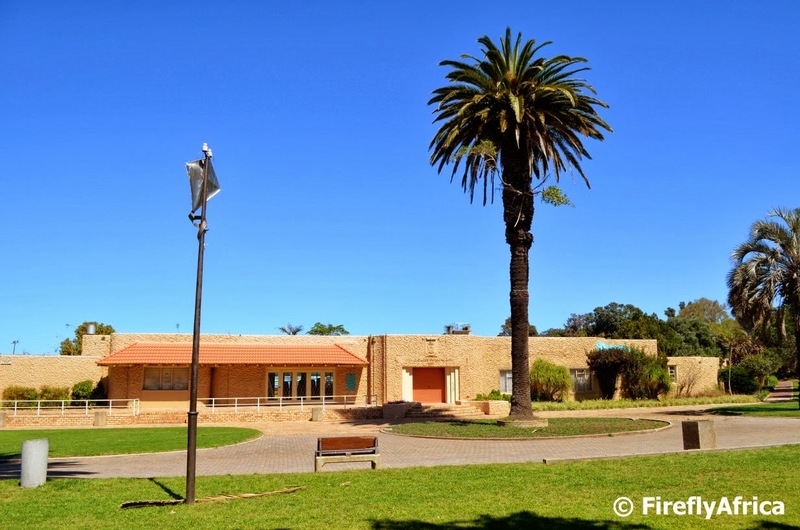 Doncaster Road is on the other side of park drive close to the Prince Alfred Guard Memorial. On the day our guide pointed out that not two of the trees lining Doncaster Road are the same. 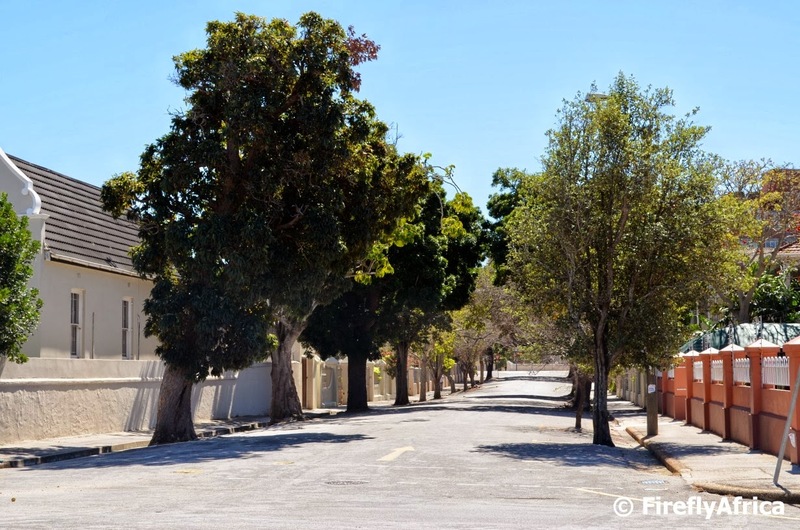 When the trees were planted it was decided to plant different species all the way between Park Drive and Cape Road in the background. Now here's the catch. I haven't been able to find any information on this anywhere on the internet. So, don't take my word on this as gospel, but if its true its something really special as far as flora in Port Elizabeth. The Coastal Fynbos Trail in Schoenmakerskop is probably one of the slightly lesser known trails around Port Elizabeth. Thanks to the PE Geocaching series which created the letters PE as geoart on the Geocache map, a few more people have set off to explore the trail lately. The trail is a circular trail and covers about 7 km on the eastern side of the village, starting at Sappershoek. 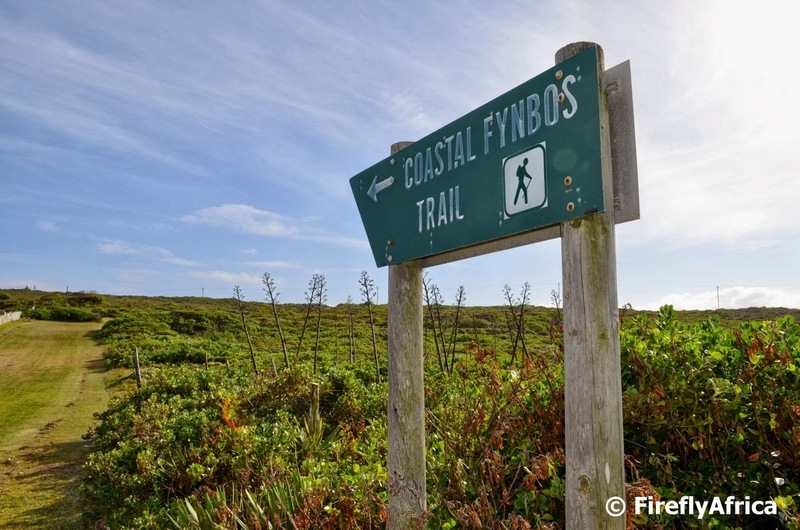 The first section of the trail is an inland route through the coastal fynbos (hence the name) and returning along the top of the ridge with beautiful views of the ocean. The inland section of the trail skirts the shifting by-pass sand dune system that used to cover the area. This dune system was stabilised in the beginning of the 1900's when Australian wattles were planted. 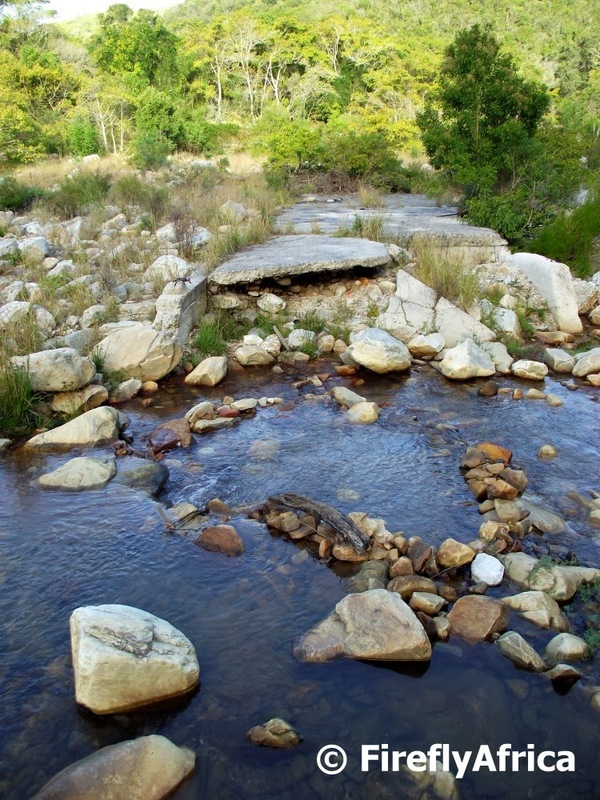 The underlying rock in this area is Table Mountain Sandstone which supports fynbos (part of the Cape Floral Kingdom, one of the world’s six floral kingdoms, supporting approximately 9000 plant species of which 70% are endemic). Along the trail calcrete outcrops, derived from calcium rich marine deposits and deep dune sands together with variations in topography and the influence of salt laden winds and fire have led to a mosaic of vegetation communities. Without fire the coastal dune thicket, comprising many forest species, would become more dominant. In areas that the last big fire missed, the fynbos / coastal dune thicket mosaic is much taller and the fynbos is dominated by Metalasia and Agathosma (buchu). Info courtesy of the Nelson Mandela Bay Tourism website. 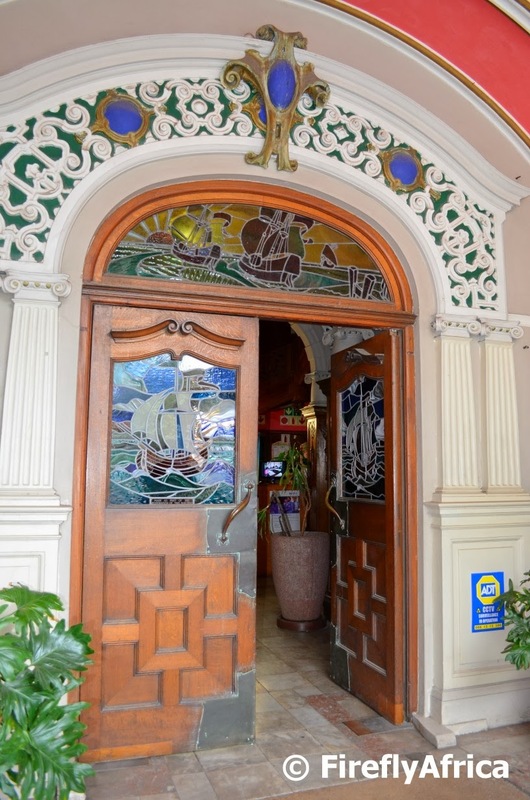 A restaurant (and pub) in the oldest hotel in Port Elizabeth. Sawdust covered floors. 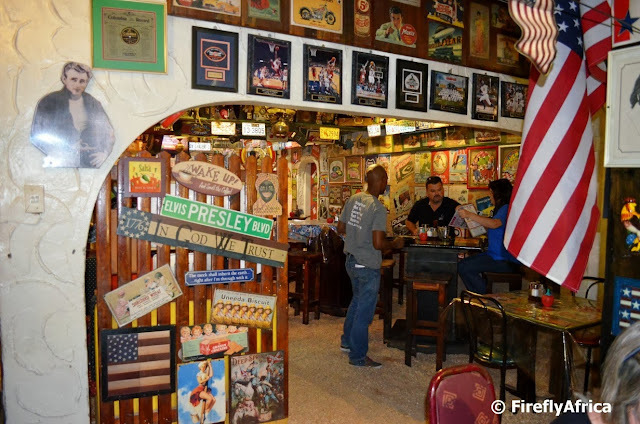 American memorabilia all over the walls... and ceilings. Historic memorabilia scattered in-between the previously mentioned American stuff. Friendly people. Relaxed atmosphere. Flippen good food. Staff taking photos of each and every table to post on Facebook. Excellent service (even if they're not willing to admit it). Where am I? The Stage Door at the Phoenix Hotel in Central is all of that and more. If you're looking to take visitors to a restaurant with a difference, this is the place. You will never struggle to find something to talk about as there is always something you probably didn't notice before. Another thing that adds to the atmosphere of the place is the fact that they try to fail with hot beer, lousy food and bad service. They fail miserably at failing. I do love their tongue in cheek approach though. 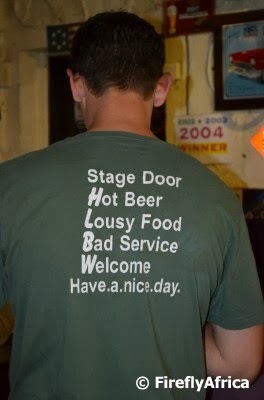 I went to lunch at Stage Door with a group of about 40 people a little while ago and everything went like clockwork. Much better than some of the other places we went to. As the waiter was clearing off plates he asked one of the ladies on our table if she enjoyed the food. Trying to play them at their own game she said "no". Without blinking he chirped back, "Yeah, I don't really care but I get paid to ask." All she had to return on that one was to burst out laughing. Not the reply she expected . Well played dude, well played. 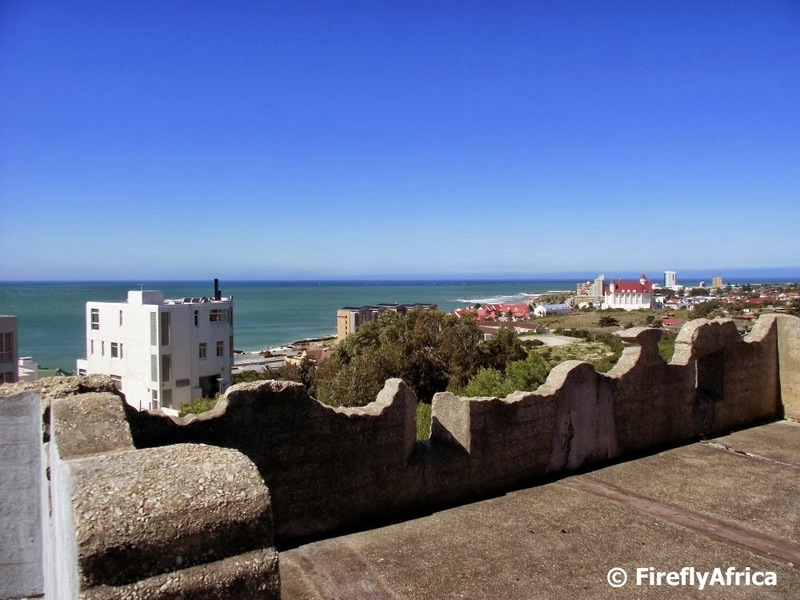 During the Second World War a series of harbour defences were built around Port Elizabeth to keep a lookout for approaching enemy ships, planes and submarines. 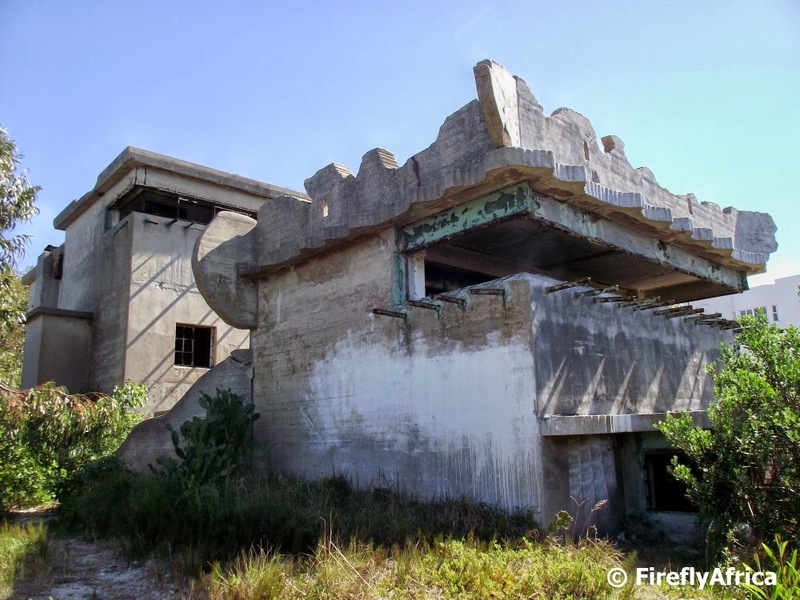 The harbour defences consisted of three Forward Observation Posts (FOP) at Schoenmakerskop, Cape Recife and Bluewater Bay along with the Algoa Battery building in Humewood and the Battery Observation Post on Brookes Hill overlooking Happy Valley. I started out my exploration of these old buildings because they are the sites of a series of Geocaches, but the history started to interest me. A bit of research later and I discovered a great article on the South African Military History Society website with all the info I needed. After visits to the three FOP's my next location was the Battery Observation Post (BOP) on Brookes Hill. 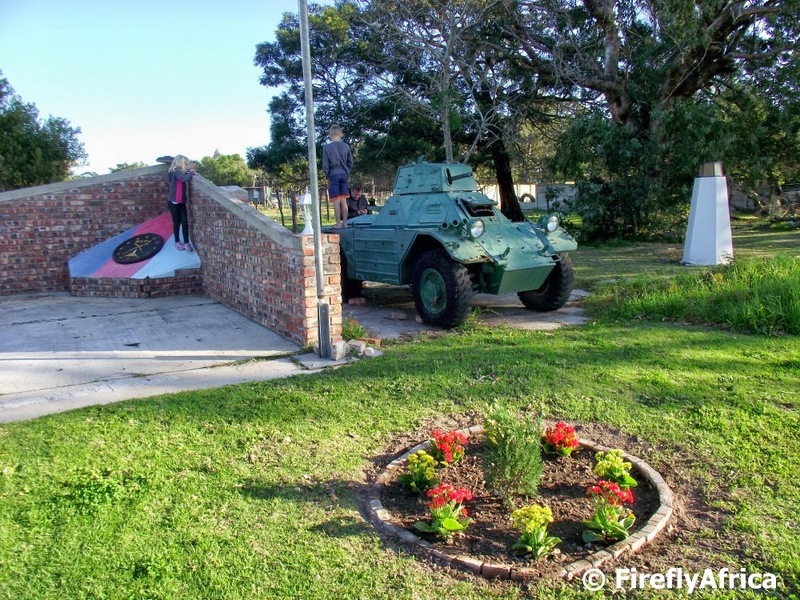 The Algoa Battery seems to be inside the military base behind the City Lodge so I'm not sure I'll get an opportunity to visit it. The Brookes Hill BOP (also referred to as the Day BOP) had a commanding view of Algoa Bay back in its time. 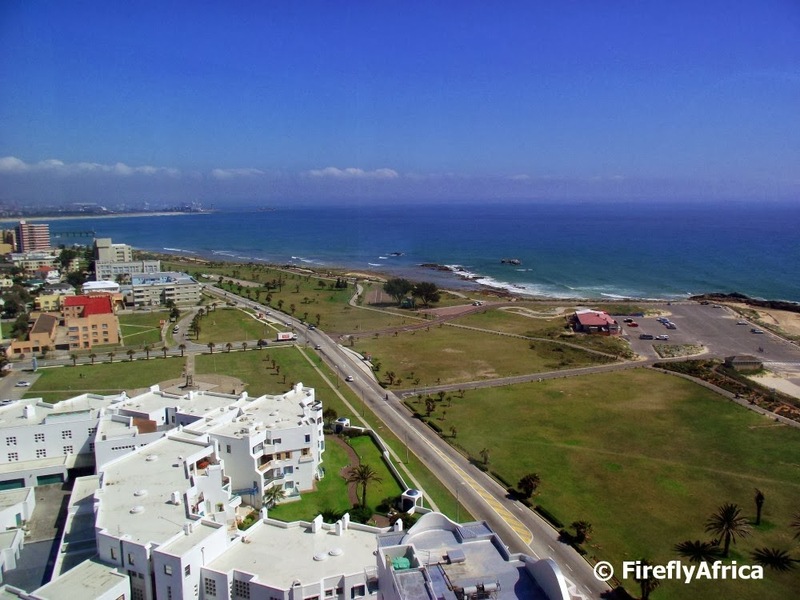 Today most of its view is blocked by apartment buildings although the beachfront towards Summerstrand and the bay beyond is still visible. It really is sad that these buildings have been so badly neglected. Imagine turning it into a coffee shop or little restaurant and enjoying this view while having a meal. Its a pity that more Port Elizabethans don't visit the Van Stadens Wildflower Reserve. Its not that far out to Van Stadens and the reserve has a couple of lovely trails covering both the gorge and the plato to the east of it. On both the River Walk and the Forest Walk you can see proteas in flower just about all year around. 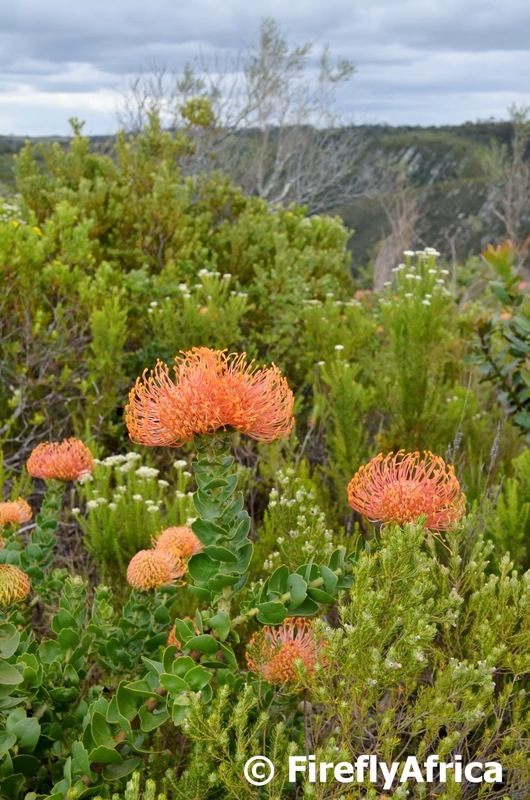 My last visit produced Pincushions and King Proteas, making the walk more than worth it. I'm probably one of the few people who's never tried sushi. That was until the other day. I took a group of bloggers for lunch in Stanley Street in Richmond Hill and after sussing out the restaurants on the strip we decided to go for Fushin. My companions decided to order a couple of sushi platters which meant I had to learn very fast. But Fushin isn't a bad choice for my first sushi experience. 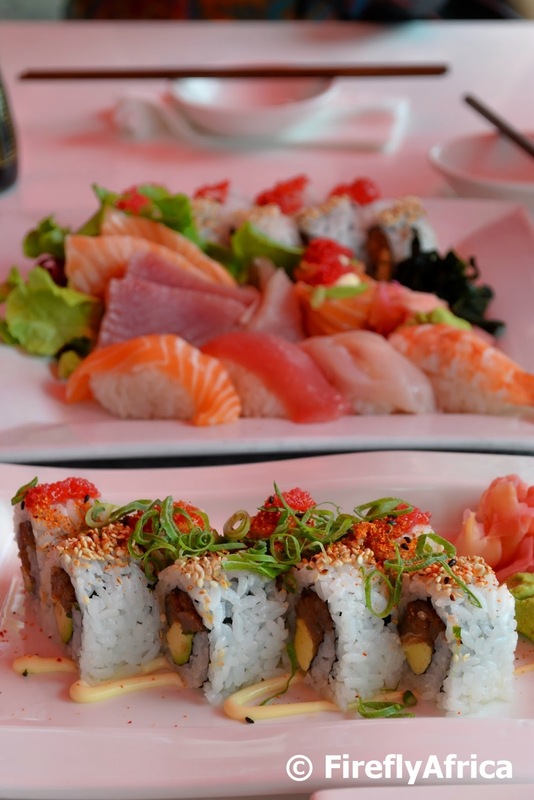 One of the bloggers, Heather Mason of 2Summers, an American living in Johannesburg, ended off lunch by saying its been the best sushi she's had since moving to South Africa. After yesterday's post, Mohair Weaving, I discovered a video on YouTube called The Hinterveld Story. The video shows some of the scenes and things you would see if you go on the Hinterveld Mohair Mill Tour in Uitenhage and the story of Hinterveld as told by Daniel Stucken. Well worth a watch. I know some PEDP purists would say, "But this isn't a photo. Where is our daily photo?" A photo tells a 100 words and this video does more. I really can't tell this whole story in a photo. Enjoy. 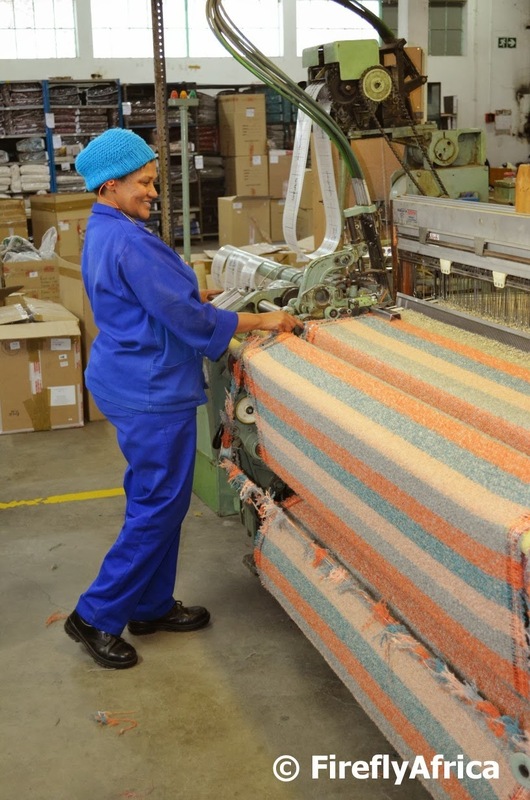 The Hinterveld Mohair Mill Tour incorporating Gubb and Inggs, Mohair Spinners South Africa and the Hinterveld Weaving Mill takes one right from where the dirty mohair comes in from the farm through the cleaning process to where mohair tops and yarn gets spun. Lastly visitors get to see the weaving process where products like scarves and blankets are woven. Here one of the weaving operators are busy creating the sought after blankets that Hinterveld is famous for. One of the best know shipwrecks around Port Elizabeth is that of the Dutch Sailing Amsterdam that ran around close to the mouth of the Swartkops River in 1817. People may not necessarily know much of the wreck, but the fact that Amsterdam Hoek along the banks of the Swartkops is named after the ship helps. The ship, captained by Hermanus Hofmeijer, hit a fierce storm in 1817 with the wind ripping apart the sails and snapping the masts. After eleven hours of fighting to keep her afloat the battle was lost and the captain decided to run her aground between the Zwartkops and Coega rivers. Only three of the 223 men aboard were lost. At that stage Port Elizabeth didn't exist as a town yet and only consisted of a fort and garrison so the crew were taken to Uitenhage before sailing back to the Netherlands a month later. 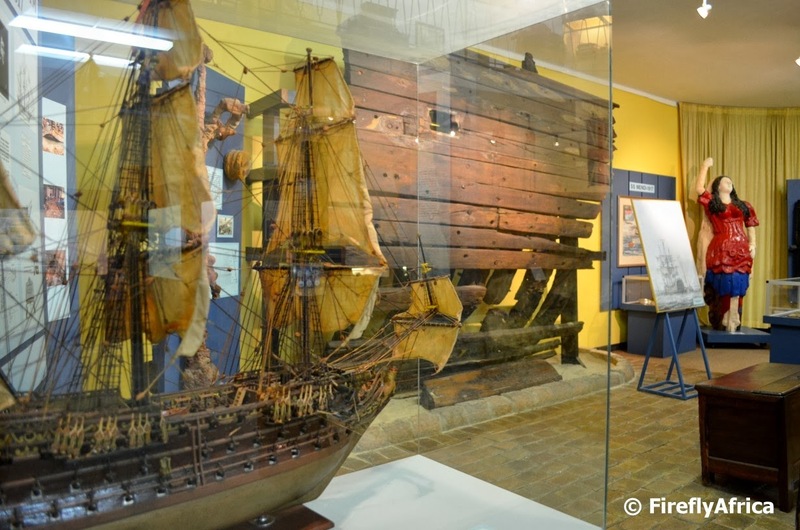 The Port Elizabeth Museum at Bayworld has an excellent exhibit of artifacts and pieces from the ship and any local interested in the history of the Port Elizabeth area would really enjoy the what is on display. 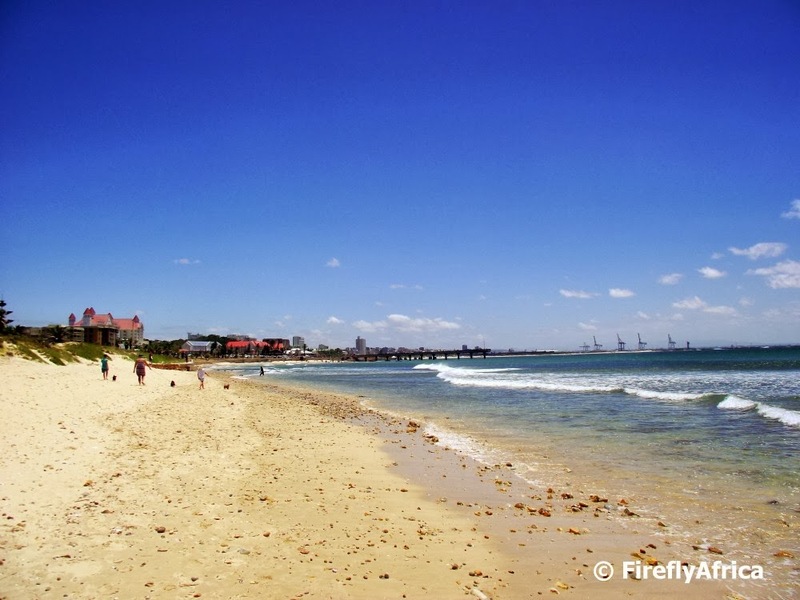 Over the summer holidays Port Elizabeth's beaches have been packed due to some notably outstanding weather. Looking at some pictures I took in November I found this one taken at McArthur Pools with Kings Beach in the background. Not a soul in sight. Tranquil compared to what it looks like around there at the moment. Cubata Portuguese Grill house in Sydenham is fast becoming a real institution on the Port Elizabeth restaurant scene. Just don't go there if you're looking for sophistication and service excelence. But who needs that? The restaurant is very informal and patrons bring along their own drinks (there is also a self service honosty cold drink fridge for those who arrive empty handed). Seeting is on wooden benches and the waiter is the owner himself, so don't "pop" by if you are in a hurry to go somewhere else. But that is part of the place's appeal. 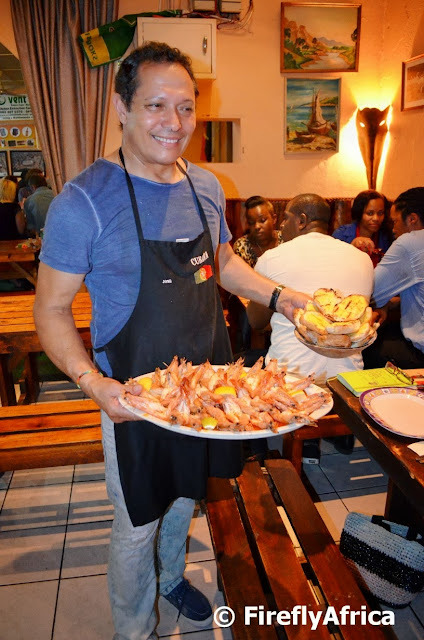 In between taking orders and delivering food, owner José Carlos Rodriguez Nobrega stopped by the table a couple of times for chats, telling us how he came from war ravaged Angola many years ago and eventually started Cubata. So what kind of food can you expect at Cubata, you ask? Well, sticky ribs to die for, mouth watering prawns and proper Portuguese chicken. Yes, some other stuff as well, but these three are the important menu focus points. Heather Mason recently did a blogpost about Cubata on her blog 2Summers. Most people associate Addo Elephant National Park with elephants only, but its really so much more than that. 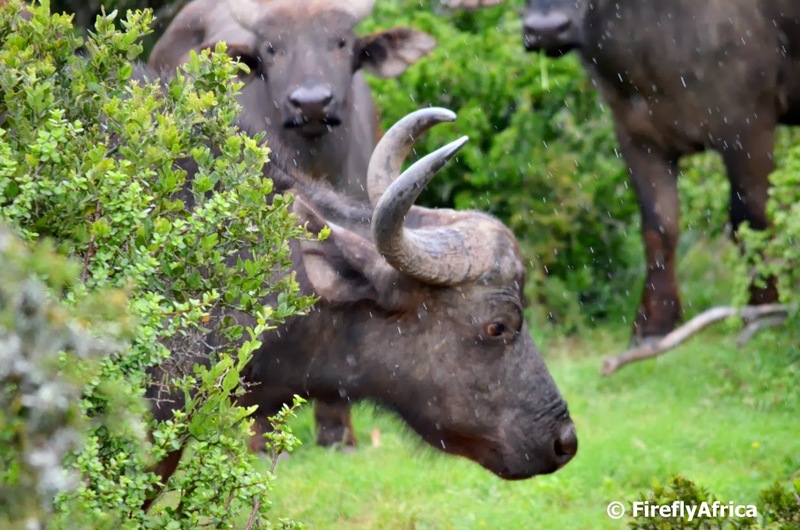 The park has had Cape Buffalo right from the start although they stuck to the bush and lived a nocturnal life due to hunters in the early days. After lions were introduced into the park the buffalo changed the behaviour back to normal and visitors started seeing them more and more. My last visit was on a rainy day and we found a big herd browsing right next to the road. 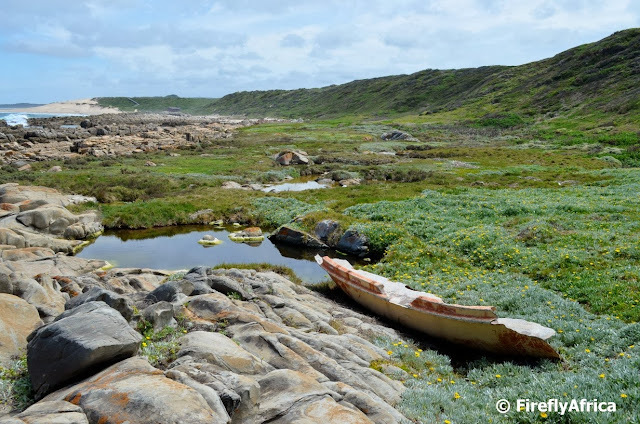 At the eastern end of Schoenmakerskop you will find one of the lifeboats from the Oceanos that sank on the Wild Coast in 1991. Personally I think its quite a significant "wreck" on our coastline. Going the other way, about halfway along the Sacramento Trail west of Schoenies, there is what also looks like the remains of a lifeboat. Some of the knowledgable locals may know where its from, but I just thought it made for an interesting object to include in a photograph. 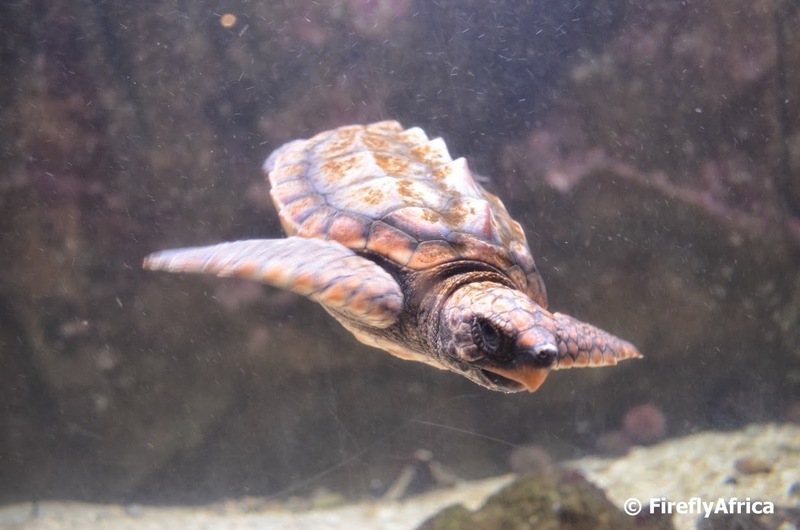 Visitors to the Oceanarium at Bayworld will find a tank with baby sea turtles in it. Most of these were hatchlings that got washed up after storms forced them out the warm Mosambique current and into Algoa Bay. They're often in cold shock due to the sudden change in water tempreture that also compromise their condition. If you had a time machine and could choose any time to go back to, what time would you choose? I think most children would choose to go back to the time of the dinosaurs. Bayworld gives visitors a opportunity to get to know some moving life sized dinosaurs fairly up close and personal. 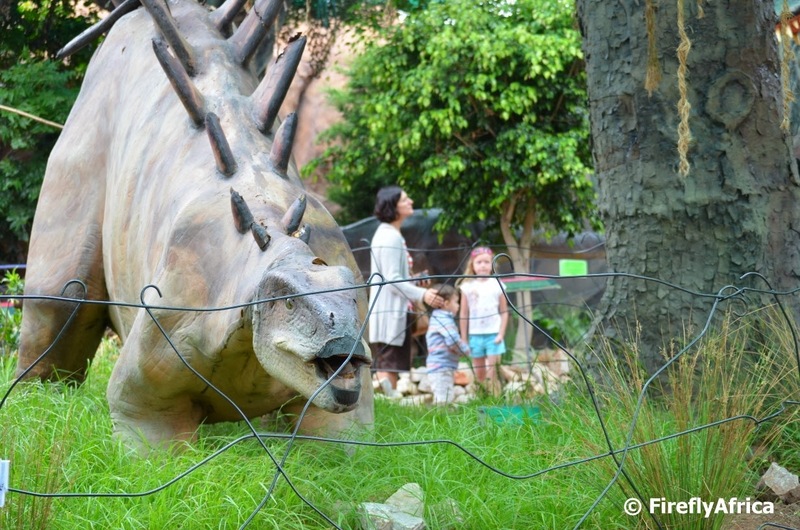 Amongst them a life size T-Rex. Happy New Year! 2014 has arrived and while we're staring down the barrel of a whole new year I'm sure a lot of us are still wondering what happened to 2013. Personally 2013 was a tough yet rewarding one, but the prospects of 2014 is looking good. The year kicks off with me starting a new job towards the end of January, the KidZ and I will feature on an insert on Pasella on SABC 2 in February and who knows what good things the rest of it holds. I'm also looking forward to my second year of geocaching and to possibly give both my blogs a new look and feel. But enough about me. I really hope 2014 holds happiness, prosperity and all things good for all of you. I'm celebrating the new year with King Proteas as my first picture for 2014. 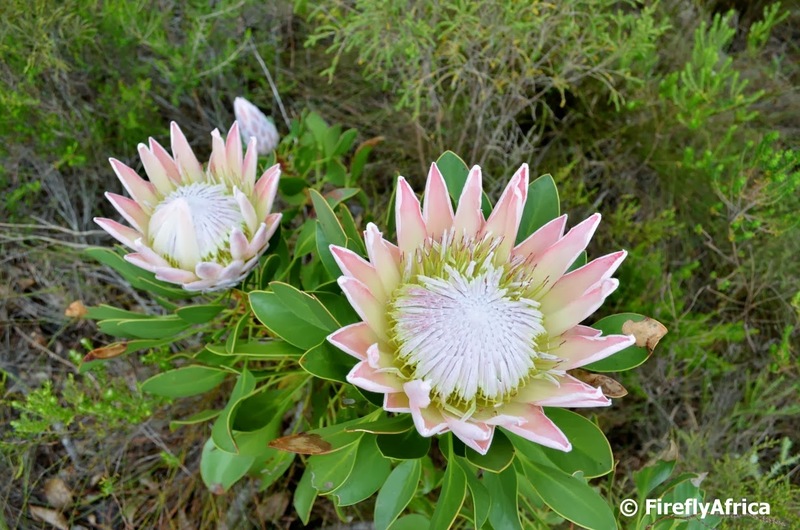 The King Protea is South Africa's national flower and forms part of the Cape Floral Kingdom (a natural UNESCO World Heritage Site) or as we all know it, Fynbos.